Christmas at Kew – an after-dark landscape lit up by over one million twinkling lights, with a brand new trail winding through the Gardens. It sounds spectacularly sparkly. This winter, the Royal Botanic Gardens, Kew will transform into a spectacle of light and sound as the much anticipated Christmas at Kew returns. 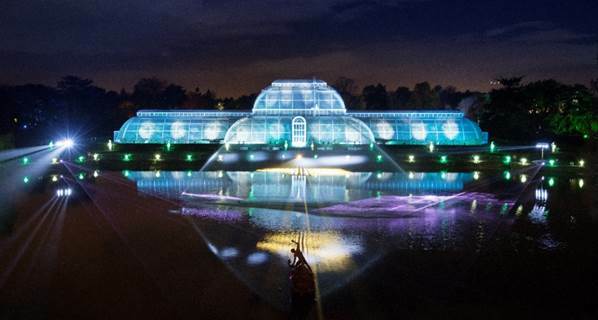 After the success of the last four years, Kew has again teamed up with entertainment promoter Raymond Gubbay Ltd to create a brand new illuminated trail, featuring over 1 million twinkling lights. The trail will wind through glittering trees festooned with silvery shards of light, snowflakes and stars. Children and adults can delight at the sight of an enormous glowing Sledge Tree constructed from over 360 wooden Santa’s sledges. Following this will be the sound of a chorus of Singing Trees leading to one of Kew’s most stunning attractions, its glistening lake. The lake will be an “ethereal spectacle of light and sound” with the lake’s two islands slowly coming to life as angelic voices call and respond across the water. The trail will feature many new and unique installations by a range of artists; an ephemeral ultraviolet walkway of thousands of continuously moving bubbles, clusters of trees wrapped in ever-changing ribbons of light, and a majestic weeping beech tree dripping with sparkling lights. Visitors will get the chance to warm up in the heat of the Fire Garden which will this year form a striking corridor of intricate pulsing fire sculptures and rotating lantern-lit Christmas trees. An installation from French art studio TILT, will form an enchanted promenade of hundreds of huge glowing peonies, giant grasses and coloured reeds. Along the trail, there will be the chance to stop for delicious roasted chestnuts, mulled cider and other tasty offerings, while kids will be thrilled at the chance to toast their own marshmallows. The Great Broad Walk Borders, the world’s longest double herbaceous border, will for the first time form part of the trail. The stroll along the borders will culminate in a host of giant trees, made from thousands of colourful, sparkling flowers complete with holographic petals, from creative studio PITAYA. Of course, it wouldn’t be Christmas at Kew without the show-stopping Palm House finale. The pond and magnificent glasshouse will spring to life with an explosion of colourful criss-crossing laser beams, jumping jets of light, and new for 2017, kaleidoscopic projections playing across a giant water screen. Christmas at Kew runs from Wednesday, 22 November 2017 until Monday, 1 January 2018. Choose your entry gate: There are two entry gates. The main entrance is Victoria Gate. However, limited pre-paid parking (booked online in advance) is available at Kew’s Ferry Lane car park in conjunction with entry at Brentford Gate. Tickets are on sale now. Click here for further information and tickets.